Tuesday's Republican primary runoffs may not be over yet for at least one candidate. 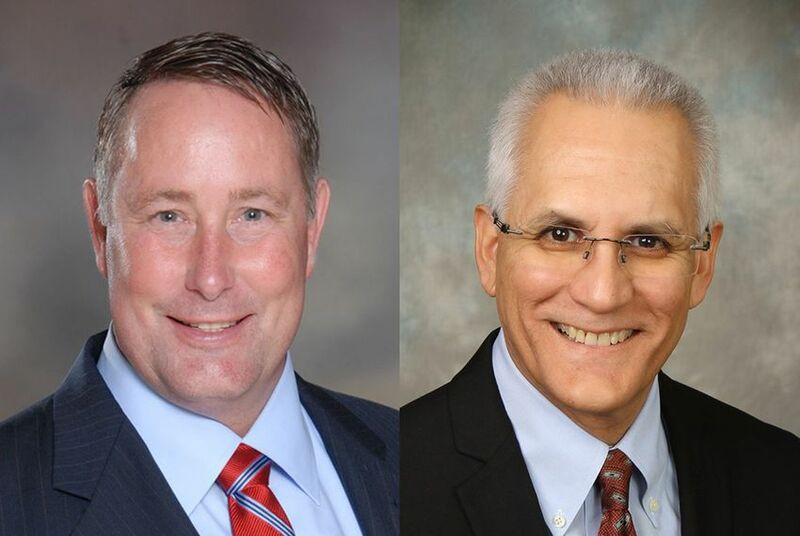 Former Killeen Mayor Scott Cosper (left) defeated optometrist Austin Ruiz in House District 54's Republican primary runoff in after a recount was completed June 16, 2016. Editor's note: This story has been updated to include House District 33 candidate John Keating's concession. The contests produced a number of narrow margins — including in House District 54, where Killeen Mayor Scott Cosper won by just 43 votes. His opponent, Killeen optometrist Austin Ruiz, said late Tuesday night he has "decided to pursue filing for a recount." In House District 33, Heath City Council member Justin Holland beat Frisco Mayor Pro Tem John Keating by 99 votes. Keating said late Tuesday — when unofficial returns showed he was down by only 29 votes — that he would wait for all ballots to come in, including those from the military and overseas. On Wednesday morning, however, Keating said that decision was based on incorrect results from Rockwall County, and he bowed out of the race. "Though there are still outstanding ballots, the updated vote difference is one which cannot be overcome, so this race is now final," Keating wrote on Facebook. "I congratulate Justin Holland on his victory." A losing candidate can ask for a recount if the number of votes by which he or she lost is less than 10 percent of the total number of votes his or her opponent received, according to the secretary of state's office. The deadline to apply for a recount is by the end of the fifth day after the election or the second day after the vote totals are canvassed. The narrowest margin of the night came in House District 128, where Deer Park attorney Briscoe Cain toppled longtime incumbent Wayne Smith by 23 votes. Smith conceded as soon as the outcome became clear Tuesday night, and his campaign confirmed Wednesday morning he would not be asking for a recount. Smith is not the only candidate who narrowly lost to pass on a recount. Rio Grande City Mayor Ruben Villarreal, who lost to pastor Tim Westley by 91 votes in Texas' 15th Congressional District, said Wednesday morning he does not plan to ask for a recount.